Coming up: The Fair Food Nation takes on holdouts Wendy’s and Publix with a Florida “Summer of Action”! 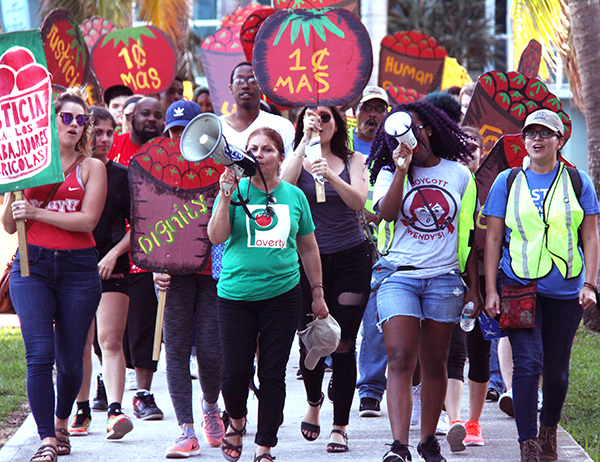 Energized by an eventful couple of months in the Wendy’s Boycott, farmworkers are announcing a series of Florida protests to turn up the heat on Wendy’s and longtime Fair Food holdout Publix Supermarkets in the dog days of summer! After Wendy’s declared its decision to repatriate tomato purchases from Mexico in response to the tremendous pressure consumers and farmworkers have built over the course of the two-year boycott and the spring’s powerful five-day Freedom Fast, we have put fast-food holdout and Board Chair Nelson Peltz in the hot seat for failing to commit to farmworker human rights by joining the Fair Food Program. Wendy’s move to greenhouses does not shield workers from the abuse and poverty experienced in the fields, and infrequent third-party audits lacking worker participation and effective enforcement fail to truly protect workers. With these truths in hand, 200+ marched to Mr. Peltz’s Manhattan offices a couple weeks ago to demand, “Wendy’s, How Much Longer?,” while hundreds more from coast to coast called in, sent letters, and educated friends and family about Wendy’s shameful evasion of responsibility. For inspiration, check out the reportbacks from lively protests in Sarasota and Ft. Myers earlier this summer! If you’re not in Florida or not able to take part in the series, sign up to participate in our “Farmworkers in the Pulpits/Bimah/Minbar” Labor Day weekend call to education and action (Sep. 1-2). If you’re a student or young person, consider applying for the 2018 Encuentro gathering in Immokalee (Sep. 20-23)!